Moving from California to Seattle means that I finally got my tatting somewhat sorted out. Well… not really. But at least it’s all contained in one place now. The process made me realize just how many unfinished projects I have started. I used to be pretty good about finishing what I started, but then again, I also didn’t use to have so many shuttles making it so easy to start new ones before the old ones were finished. Since I’m starting to feel like my study schedule is under control I’m going to dive into a goal I’ve been wanting to set ever since I got moved up to Seattle. In an attempt to sort through the UFOs (UnFinished Objects) I’m going to attempt to finish project every week. 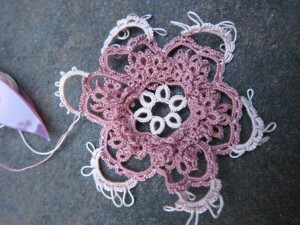 Some of these projects will need more tatting, some just need the finished piece to be sewn up or the ends to be hidden. 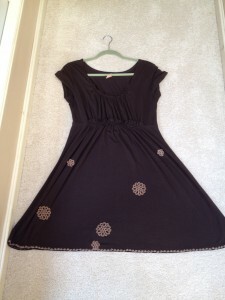 This week’s project was to decorate this summer dress. I added the edging a while back, but almost immediately afterwards managed to get a couple spots of bleach on it. So I made these flowers to cover them up. 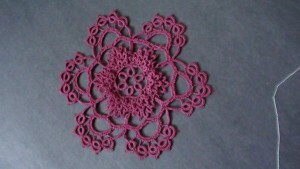 I used the motifs from the Star Doily in Priscilla Tatting #3 which has become my go-to pattern for a round motif. 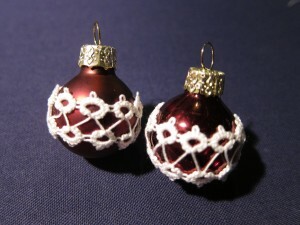 The smaller ones are simply the center part of the full motif. I had the tatting finished a few weeks ago, but this week I finally got them sewn on the dress. Now that I’ve got them on there I’m thinking they look a little sparse so one of these weeks I may “restart” the project and add some more, but for now I’m calling it finished. One project down. Seventeen to go. Wish me luck. 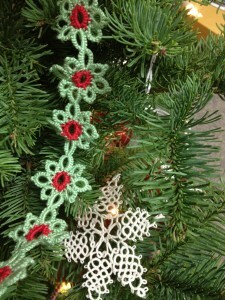 Here’s the second Christmas garland that I finished this last week. In these colors it reminds me of holly and ivy. 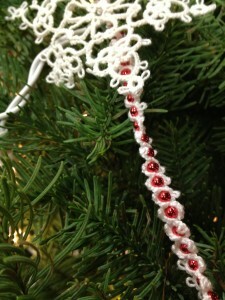 This one uses a pattern from Priscilla Tatting Book number 2. I’ve just realized that though I started using this pattern a while back, I never actually posted the pattern or my variation. It’s always nice when I have very few changes to make on the original pattern. That’s been the case a lot lately and I think this is because I’m still working on the tea cloth which has lots of changes so I’ve been picking easier patterns to work on as side projects while I struggle through that. I’ve had my eye on a couple of more complicated projects and I’m trying hard not to start them until I’ve finished up some more of my other works-in-progress. And here’s one of those former WIPs! I started this soon after Christmas and decided to just keep going with it until I ran out of the red thread. Ended up getting just under 7 feet of it. Here’s the instructions. My main change was to make the rings of the flower 7-1-7 instead of 8–8. I don’t like to join all my rings to one center picot because then I have to guess at the right length to make it and because I think it’s stronger if you do a serious of picot joins instead of one large one. Seems to also make it a lie a bit flatter and more even as well. 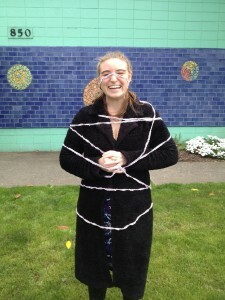 Except for that and a pair of Shoe Lace Tricks the pattern pretty much stayed intact. Repeat from ** 4 more times for a total of 6 rings, joining the second picot of the last ring to the open picot of the first ring. 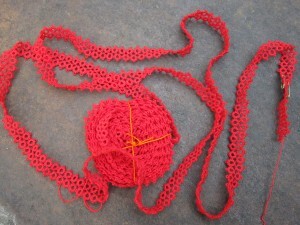 Repeat from * joining the second picot of the first chain in the flower (first 3-3-3-3 chain) to the ring between flowers. Continue until desired length is reached. That’s it! Hope you like it! Now that I finished off both the Christmas garlands that I started around Christmas last year I’ve been flipping through the Priscilla books to pick out the next on to do. I think I’ve got a good one picked out, but since it involves changing a single shuttle pattern into one with split rings and maybe even three shuttles with split rings and single-shuttle split rings I want to make sure it works before I post in detail about it. Busy month! Lots to get caught up on from Shuttlebirds, Camp Wanna Tat and other projects, but I’m going to start with the Christmas garland from my last post. Finished it! I had been hoping to get it done before the end of Shuttlebirds but didn’t finish it until the day before the LPS meeting last week. 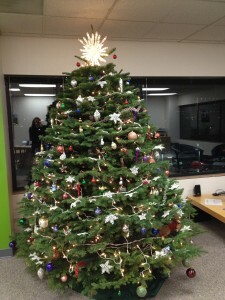 This was taken outside our meeting space after I showed it off to the group. Nice to finally finish it. It’s a cute pattern when finished, but it’s basically just all chains and when you’re making 30 feet of it (technically 60 feet, because you do one side and then the other) it gets a bit boring. I probably should have just put it aside for a while and come back to it in a few months, but I’m trying to go through my started projects and actually get a bunch of them finished so it feels good to have this one done. I had actually been working on two garlands and when I finished this one I got back to working on the other. 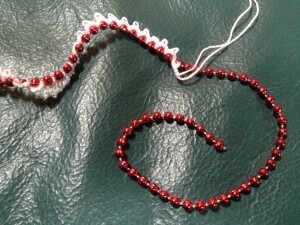 I was only making that one as long as it could be until I ran out of the red thread for it. Did that this last week so I’ll share that next. Strange to finish both Christmas garlands so early in the year. Guess it’s time to start on another!